Join 200+ delegates, 60+ speakers, in San Francisco on May 14 - 17 for four days of inspiring content. 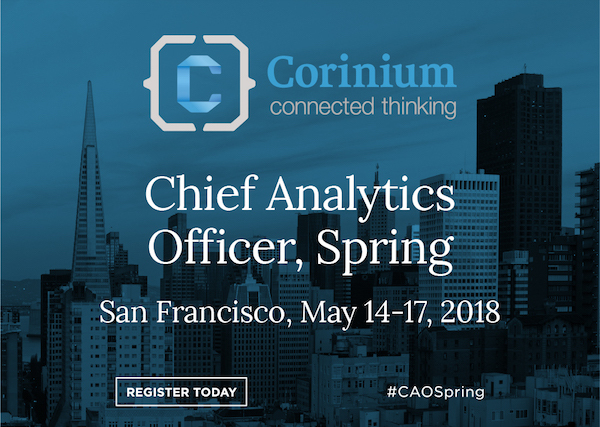 The third edition of Corinium’s Chief Analytics Officer Spring is set to return to the West Coast and will be taking place in San Francisco on May 14-17, 2018. The Chief Analytics Officer, Spring 2018 conference is not just for Chief Analytics Officers: it may be led by CAOs, but all top level analytics, data, data science, business intelligence specialists cross-industry are welcome, allowing you to meet and network with the very best of your peers from a range of organizations and backgrounds. This year we will be hosting four days of industry leading content. Day 1: The machine learning, deep learning and AI for strategic innovation pre-conference focus day will be making its return on 14 May covering topics such as Hype vs Reality, Anomaly Detection, Definitions of ML and AI and much more. Day 2 & 3: Corinium’s signature two-day main conference will be taking place on 15-16 May featuring all of the hottest topics for data and analytics leaders everywhere. Featuring inspiring keynotes, insightful panel discussions and our innovative discussion groups. Day 4: Will feature our newly launched csuite connections event, the clevel networking event designed to bring business leaders from all areas of the business to address common challenges. This edition will be focusing on digital transformation and strategies for overcoming its associated challenges. Bringing together csuite leaders from across industries, for a day of workshop style interactive sessions and case studies where we discuss key areas. Learn more about the Chief Analytics Officer, Spring 2018 agenda at the website. Learn more about the Chief Analytics Officer, Spring 2018 sponsors at the website. Register for the Chief Analytics Officer, Spring 2018 at the website. Receive a 20% discount using discount code with SMP20 for 20% off your registration cost. Visit the Chief Analytics Officer, Spring 2018 website for more information. Keep up-to-date on Twitter @CoriniumGlobal and hashtag #CAOSpring. Corinium Global Intelligence is also social from @CDOHangout, @CAOHangout and @CCOHangout.